Rita Moreno has a lover’s dance quarrel. Today we come to one of the best episodes of The Muppet Show‘s first season. It still isn’t perfect by the standards of the later years. The backstage plot still isn’t much more than a series of the same gag, recurring over and over in different permutations, and the guest star still takes no part in it. However, in Rita Moreno, the Muppets find their best human companion up to this point (at least on this series), and more often than not, the material she’s given fits her like a glove. In fact, she would even come to win an Emmy award for her appearance, so viewers clearly could tell something special was happening here. In some ways, Moreno’s persona is the perfect combination of Ruth Buzzi‘s gusto in feeling free to really play with the Muppets physically–not treating them with kid gloves but instead diving into the sandbox with them, so to speak–and Harvey Korman‘s prickliness. She doesn’t go as far as Korman, particularly since she exudes warmth and enthusiasm as Buzzi did, but, like him, she criticizes Kermit and the show when things aren’t going her way. Unlike him, she actually ends up with the upper hand. Most of the time, that is. Her first number, which highlights the dancing skills she is famous for, largely thanks to her role as Anita in the film version of West Side Story, is actually quite reminiscent of Buzzi’s “Can’t Take My Eyes Off of You” with Sweetums in her episode, in the idea of a choreographed number in which a woman overpowers a man, differences being that this dance is fully instrumental (set to the melody of “I Get Ideas,” a tango from the ’50s that Desi Arnaz once sang on I Love Lucy) and this is no fairy tale, documenting what seems to be the dissolution rather than the start of a romance. Whereas Buzzi played a wide-eyed princess with love and a song in her heart, Moreno storms into a bar where she finds her lover flirting with Miss Piggy, and in response, she pulls him into a fierce, fiery dance that has her physically attacking him–with her bare hands, with furniture–and sometimes literally picking him up and flinging him across the room, an effect seamlessly accomplished by the full-body Muppet portraying him sometimes being swapped out for an empty version of the puppet that she can twist and lift and throw. Rita has a bone to pick with the cue card guy. It’s visceral, funny, and gleefully, cartoonishly violent, reveling in slapstick hijinks that ultimately culminate in her breaking a hole in the wall and throwing him out of it, and then him running around the building and back inside and kicking her out of the same hole. Even with that, though, she can claim the ultimate victory as, after a quick celebratory shot at the bar, he immediately passes out, having clearly succumbed to the injuries she inflicted upon him. Moreno’s very funny temper recurs throughout the episode, another great example being her Talk Spot with Kermit, in which it’s also tempered (ha ha) with sweetness. She sits with Kermit, playfully tickling him, and, as he’s about to launch into their conversation, she stops him for a moment and, being friends with him, asks whether they could maybe break with typical variety show protocol and have a real, off-the-cuff conversation. She complains that the talk spots on these shows always seem so phony, with actors clearly reading off of cue cards, to which Kermit delivers the superb meta gag of then protesting that they don’t read off cue cards on The Muppet Show, while very obviously, stiltedly reading even that line off a cue card–the wink-wink joke to the home audience, of course, being that all of this is scripted, including her complaints about it being scripted, because otherwise that line wouldn’t be there for him to read! But returning to the “reality” of the scene (which the show itself is cleverly undermining at every turn), Rita yells at Kermit in frustration, asking if they could please just make it up as they go along, but Kermit insists that, although he doesn’t mind, there are others who might take offense. She asks who that might be, and he says one is “the guy who holds the cue cards”. And then said guy actually walks on screen, revealing himself to be…Sweetums! 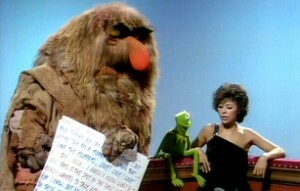 “Nice lady doesn’t want Sweetums to hold cue cards?” he asks. She replies that that’s right. “Nice lady let Sweetums hold something else?” he asks. She happily agrees, and in response, he picks her up and walks off-stage! “This happens so often on our show,” Kermit explains. “Guest stars just get carried away!” And so, technically, in this case, Moreno doesn’t win, the outcome of her Talk Spot not being hugely different in that regard than what happened to Korman (he was surrounded by Muppets and forced into a chicken suit), but she finally reclaims her status in her incredible final number, a particularly slinky, sultry version of the slinky, sultry song, “Fever”. Animal messes with Rita’s “Fever”. 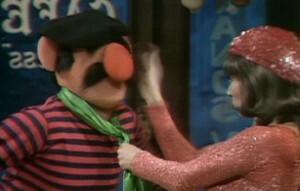 In a tight, red dress and with a long, flowing wig, Moreno sings much more seductively than one might expect a human to do on The Muppet Show, and yet she is constantly undermined by Animal on the drums, who keeps beating them too roughly, smashing the cymbals too loudly, and/or quickening the tempo when he gets bored by the slow pace, reminiscent of how he sped up an instrumental number in the Ruth Buzzi episode. Whereas the rest of the Electric Mayhem put up with it and altered their performance to suit him, however, Moreno refuses to take his garbage. In an impeccably crafted comedic performance that I expect is what truly cinched her Emmy win, Moreno tries to keep face, at first ignoring him as she plows forward with the song, then scolding him in Spanish when he starts really rebelling. Finally, when he gets so loud that he drowns her out all together, she sneaks up behind him with two enormous cymbals, smashing them into him from each side to fully shut him down. “That’s my kind of a woman!” a dazed Animal cries out immediately afterwards–the first time Animal claims this catchphrase as his own (but the second time it’s appeared on the show, the first being Sweetums at the end of his song with Ruth Buzzi).